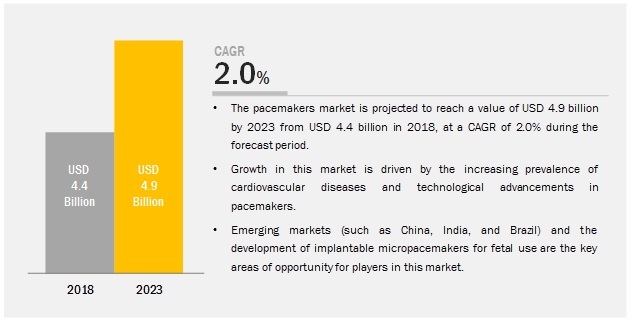 [163 Pages Report] The pacemakers market is projected to reach USD 4.9 billion by 2023 from USD 4.4 billion in 2018, at a CAGR of 2.0%. The study involved 4 major activities in estimating the current market size for pacemaker. Exhaustive secondary research was done to collect information on the market as well as its peer and parent markets. The next step was to validate these findings, assumptions, and sizing with industry experts across the value chain through primary research. Both the top-down and bottom-up approaches were employed to estimate the complete market size. Thereafter, market breakdown and data triangulation were used to estimate the market size of segments and sub-segments. In the secondary research process, various secondary sources such as Hoovers, Bloomberg BusinessWeek, Forbes, and Dun & Bradstreet have been referred to, so as to identify and collect information useful for a technical, market-oriented, and commercial study of the pacemakers market. These secondary sources included annual reports, press releases & investor presentations of companies, white papers, World Bank (US), Organisation for Economic Co-operation and Development (OECD), US Food and Drug Administration (FDA), World Health Organization (WHO), National Institute of Cardiovascular Outcomes Research (NICOR), and Healthcare Quality Improvement Partnership (HQIP). The secondary data was collected and analyzed to arrive at the overall market splits, which were further validated by primary research. The secondary research was used for the following processes, trade directories, and databases. Secondary research was mainly used to obtain key information about the industry’s supply chain, the total pool of key players, market classification, and segmentation, according to the industry trends to the bottom-most level and regional markets. It was also used to obtain information about the key developments from a market-oriented perspective. 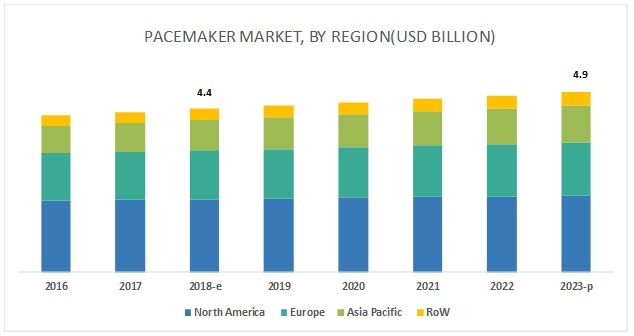 After deriving the overall pacemakers market value data from the market size estimation process explained above, the total market value data was split into several segments and subsegments. To complete the overall market engineering process and arrive at the exact statistics for all the segments, data triangulation and market breakdown procedures were employed wherever applicable. The data was triangulated by studying various qualitative & quantitative variables as well as by analyzing regional trends for both the demand and supply side macro-indicators. This research report categorizes the market based on type, implantability, technology, end user, and region. Who are the major market players in pacemakers? What are the regional growth trends and the largest revenue-generating region for pacemakers? Why are pacemaker necessary for cardiac patients? What are the major types of pacemakers? Who are the major end users of the pacemaker market?